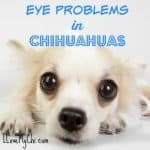 Have you ever had a deaf Chihuahua? Unlike humans, deafness is a little harder to deal with since dogs can’t talk. Fortunately dogs will pick up cues from us and can even learn a type of sign language. • Congenital Deafness. Some dog are born without the ability to hear in one or both ears. In these cases the disease is inherited and irreversible. Congenital deafness is most commonly identified in dog breeds with white pigmentation and blue eye color; however, albinism is not usually associated with deafness. • Obstructive Deafness. In this cases, deafness or hearing loss results from obstruction of the sound transmission as a consequence of occlusion of the outer or middle ear. Otitis of the middle or external ear can cause an excessive build up of earwax that occludes the outer and/or middle ear. • Age-related Hearing Loss. As dogs age it is common that they loose their hearing progressively and this is not related to trauma, genetics or other diseases. Even though this occurs progressively, most owners perceive the hearing loss as an acute event because most animals only show signs of deafness when they have completely loss their hearing ability. • Toxicity. Certain drugs such as antibiotics, diuretics and chemotherapeutics can cause hearing loss. The hearing loss may be reversible if diagnosed early but will, in most cases, result in permanent hearing deficits. Some of the drugs that may cause hearing issues are: aminoglycoside antibiotics, tetracyclines, ampicillin, chloramphenicol, cisplatin, vinblastine and vincristine, furosemide, benzalkonium chloride, digoxin, insulin, potassium bromide, prednisolone and salicylates. • Other Causes. Exposure to intense sounds may cause temporary or permanent hearing loss. Other possible causes of deafness are: trauma, infection, anoxia and anesthesia. • Your dog doesn’t respond or seems confused when given familiar vocal commands. If you identify any of the above signs you can test your dog’s hearing by stepping quietly behind him and clapping once loudly to check his/her response. Any deafness present in the dog at birth is irreversible and these dogs should not be bred but of course, they still can make great pets. The treatment of temporary deafness depends on the cause. If hearing loss is caused by an inflammation of the ear it can be treated with antibiotics and analgesics. If your dog has wax build-up in his ears, he/she will need daily ear cleaning with a prescription wash. 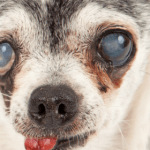 Dogs that are genetically predisposed to deafness should not be bred. Appropriate ear hygiene and care is essential to prevent hearing loss. 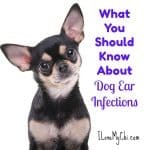 Whenever your dog is groomed you should clean the external ear (only the visible part of the ear) using a small gauze or cotton ball and mineral oil in order to prevent excess earwax build up. 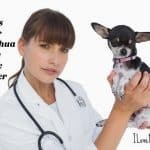 Whenever you visit your veterinarian, make sure that they check your Chihuahuas’ ears. How Can Pet Parents Help Their Dogs With Hearing Loss? • Deaf dogs can be trained to understand hand signals. • A flashlight or laser penlight can be used to get your dog’s attention. 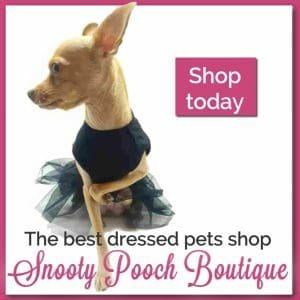 • Let your dog know that you are entering or leaving a room by tapping him/her gently on the back or shoulder. • Never let a hearing-impaired dog go unleashed outside the house because they won’t be able to hear traffic. 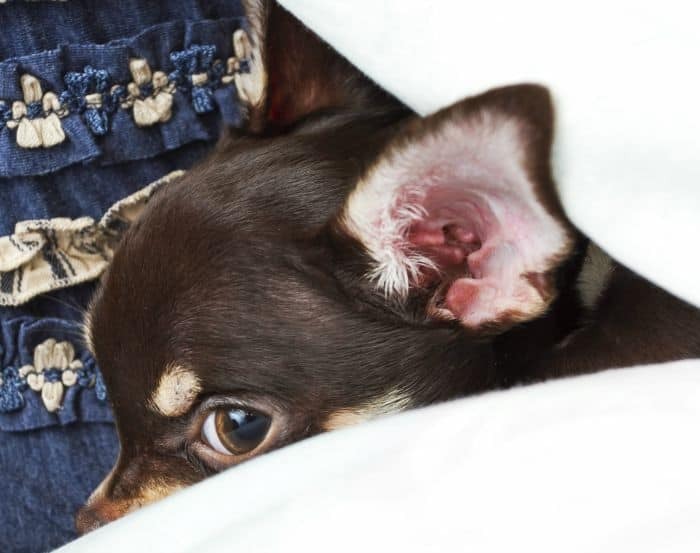 So, have you had to deal with deafness in your Chihuahua or any other dog you have had? How did you handle it? Leave a comment and let us know! ASPCA. Deafness. Retrieved from: https://www.aspca.org/pet-care/dog-care/deafness. Strain, G.M. (2013). 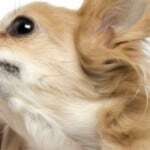 Deafness in Dogs and Cats. 2013 SAVMA Symposium, School of Veterinary Medicine, Louisiana State University, Baton Rouge, LA, US. Preventing health diseases of your pet is just as important as taking care of your own health. 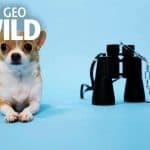 Thanks for the article, keep up the awesome blog! I have a deaf chihuahua. She is all white. Pixie is the most loving dog. I wouldn’t give her up for anything. Her other senses are strong and compensate for the loss of hearing. She was deaf at birth. 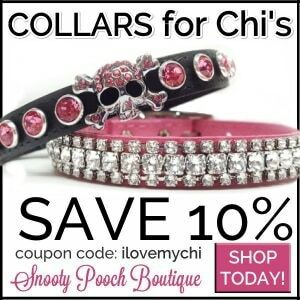 Love my chi! She’s so cute Joyce! Thanks for sharing about her. I have a 3 year old deaf Chihuahua called Così and she is the only one of my Chihuahuas that comes on command…always and instantly she sees my hand signal. The other two can hear but ignore my calls!!! It’s true that having a deaf dog is a great responsibility but it is also very rewarding. I would happily have another deaf dog. I have a new Chihuahua pup, Sasha, who is 4 mths old. I have just realised that she doesn’t respond to sound. She doesn’t notice what’s happening around her unless she is actually watching you. I absolutely adore her and was heartbroken when I realised only today. I will have to be EXTRA careful with her surroundings. I think I should get the vet to check this out but can they tell from looking at her ears? There’s mention here of light coloured dogs, Sasha is apricot with dark eyes. The vets have simple tests they do to see if a dog is deaf. Sometimes they can tell just by looking at the ears if there’s an obvious malformity but usually not. Sasha is such an adorable little girl! Thankyou for your reply. I’ll make an appointment with the Vet and see what thet find. I guess I should let the Breeder know too. Sasha is registered and I had been hoping to go to Shows with her but I suppose that is out of the question now, breeding with her in the future was something I might have considered but that is a definite “NO” now too. Mostly I’m sad that she has a silent world but I’m already looking at ways to make it a normal, happy one for her. She’s lucky she has you for her mama Katherine. My Sugar developed the age relate deafness. It did seem sudden, but according to the article, that was related to losing the last bit of hearing and my realizing them that she did not respond to sound. The vet said there was no treatment for her deafness. She responding to hand signals and touch, and I will always miss her although I do have another baby now and love her dearly. That’s good that she responds to hand signals. I have gotten to where I start with had signals when they are young and the hearing is good so it will be so much easier as they age and lose their hearing. She may very well be deaf. White chis are known to have more hearing issues that other colors. But if she is deaf, you can train her with hand signals. I’ve done that with my dogs even though they weren’t deaf. It’s helped now that my 14 year old has lost her hearing. Taco let me adopt him, from a shelter. They said on his post 8 1/2 yrs. I got to the shelter an they had posted on his cage 10 1/2. I could have care less, I had already fallen in love at first sight from his picture. It was the end of January, I had passed all the requirements. It was if they really did not want to have anyone adopt. I finally told them to call my Vet. Maybe my being a senior had something to do with their putting me off. 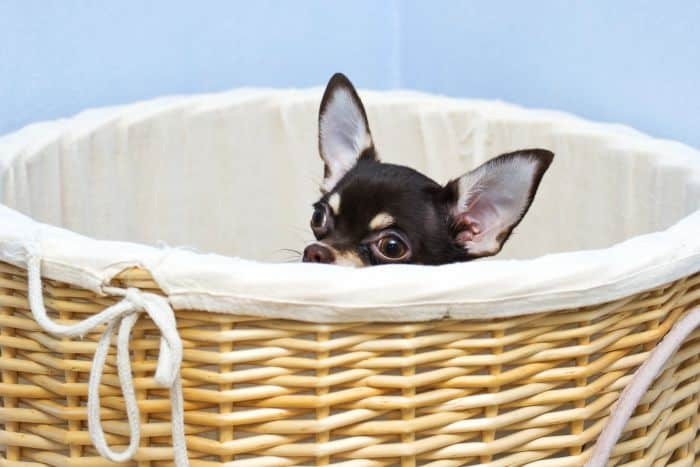 (To make a very long story shorter) When I got there to pick up Taco, he was just sitting there, very dejected, ( a real sad site) I had lost my Snoopy, to liver failure in Nov. Wasn’t even thinking of another Chi, but something drew me to that Web Site. Taco has come thru a serious digestive problem, turned 11 yrs. young, June 2, 2018. Discovered he was deaf, no problem for me, I love him all the more. We are adjusting to each other, & I am trying to teach him some simple signs. I let him know when I am leaving the room, & many, many time just go over to him & tell him I love him & so grateful for having him in my life. He is responding a little more each day. He has filled my whole being, in ways no one could imagine. We are still working on the hugs & being held. 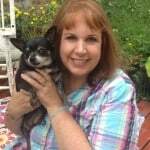 Taco is my fifth Chi/ & Chi mix, I’m a mother of two, raised four, have grand-children, & great grand-children, I turned 79 this past Sept 11 th. & pray Taco doesn’t out live me, lol. That’s a great story about Taco. I’m so glad you were finally able to get him. If you can add a photo here (just look for where it says Choose Files under the Post Comment button, I can make your story into it’s own blog post for our Chi Stories category. My 13-year-old baby is now deaf as a brick. He has been my nearly constant companion since he was just 8 weeks. I’m sure that he has been losing his hearing for some time but I never noticed because he is so attentive to my every movement. I was a tough lesson for me the day he finally let me know that he couldn’t hear anymore. I had come home through the front door after a short errand, he was waiting for me to return at the back door, where I had left. No amount of calling him got any response even though I was only a few feet away, I rewarded his loyalty and dedication by going back outside and coming in the back door as he was expecting. You sound like a great pet parent Larkin. Dogs are so intuitive, they can sometimes fool us for quite awhile about being deaf. I too am a mom of four furry girls. 2 of my girls are sisters and Deafie is all white with a few spots on her ears. She is almost 5. As a puppy, I put a cat bell in her collar because sometimes I wouldn’t be able to find her. She has been deaf since birth. She is the most sweet and loving little girl and is definitely baby-fied, due to me feeling like I needed to protect her more because she’s deaf. She knows hand signals for multiple things and I will catch her sitting there sometimes just stating at my hands. She is extra special and I wouldn’t trade her for anything! I think it’s great you and Deafie found each other. She sounds like a wonderful little dog.